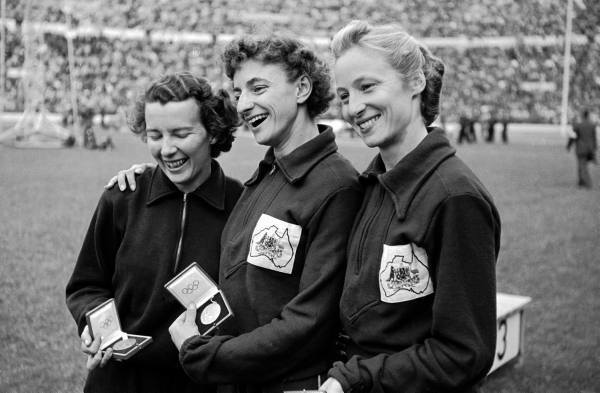 Shirley Strickland was an Australian athlete; she won more Olympic medals than any other Australian in running sports. Shirley was born, a farm girl, in 1925 – the second oldest of dive children. The town of Pithara in Western Australia’s wheat belt had no idea of the talent they were about to nurture. Yet she had pedigree: her father, Dave, has been an athlete: the only thing that had stopped him from taking part in the 1900 Olympics in Paris was the distance and the money that would have had to be spent to get him there. Shirley would set the record straight for her family – and for Australia too. Shirley Strickland’s early education was by correspondence. From 1934 to 1937 she attended the newly established local East Pithara School, winning a scholarship to attend Northam High School, where, in 1939, she won 47 out of 49 events as a schoolgirl athlete. After high school she entered the University of Western Australia from where in 1946 she graduated with a Bachelor of Science (Honours) in Physics. In her spare time she lectured mathematics and physics to returned servicemen at Perth Technical College, played wing in the university hockey team and gained a reputation as an extremely gifted sprinter and hurdler. Living on an isolated farm, Shirley Strickland received her early education by correspondence – but she did later go on to attend the Northam High School. It was here that her promise as an athlete was first recognised – she won all but two of the 49 events that she entered while she was studying there. The University of Western Australia was her next stop – she graduated from there in 1946 and went on to lecture in physics and mathematics at Perth Technical College. While there she was the wing in the hockey team but what really marked her out was her ability as a hurdler and sprinter. The former world professional sprint champion, Austin Robertson, coached her during her time at Perth. 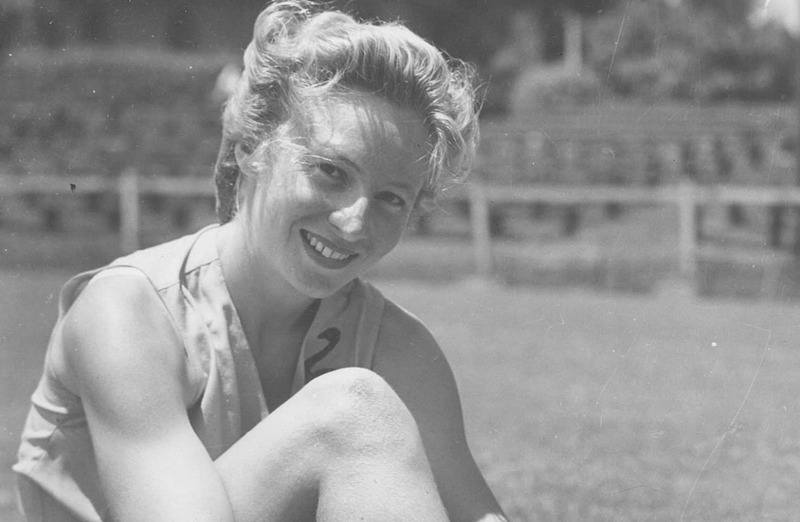 As a result her 100m yards time went from 11.8 to 11 and she went on to win four Western Australian titles in 1947 – throwing in the shot put as a casual fifth. It was time to take things seriously. 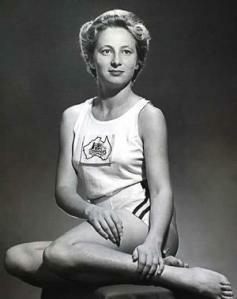 In 1948 she took the national title in the 80m. That gave her a ticket to the first post Second World War Summer Olympics in London where she competed in the 100m, 80m hurdles and took part in the 4×100 relay. She came third in her solo events, taking silver with the team in the relay. The British Empire was on the wane but that did not stop her from taking three gold medals at the Games in 1950. Following this up, she participated in the 1950 Helsinki games where a gold medal in the 80m hurdles beckoned – a world record time of 10.9 seconds. She also collected silver and bronze in the 4x100m relay and the 100m hurdles. Another world record was beaten in 1955 where she was times at 11.3 seconds for the 100m hurdles. 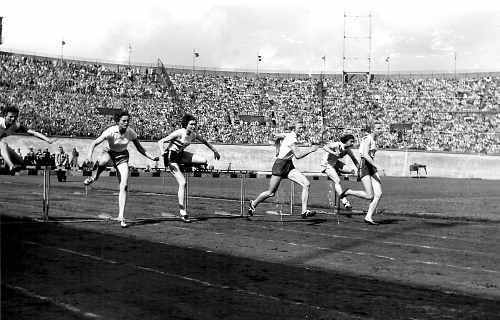 The Olympics of 1956 on home territory in Melbourne brought gold in both the 80m hurdles and the 4.100m relay. Following her athletic career she became fully involved with athlete administration in the Olympic movement and participated in this role in the 1968 and 1976 Olympics in Mexico and Canada. She was one of the torch bearers at the opening ceremony of the Summer Olympic Games in Sydney, Australia in 2000. The following year she gained some notoriety when she sold off all her memorabilia, including her Olympic medals. The collection was acquired by the MCG Museum in Melbourne, purchased but a group of business people who remained anonymous but who, like Shirley, wished to see her outstanding collection remain in Australia. Shirley Strickland died on 16th February 2004 when she was found on her kitchen floor, but the coroner determined that she died on the evening of 11 February. There was no full autopsy and the coroner said the cause of death was “unascertainable”, though “not inconsistent with natural causes”. She was honoured with a state funeral. Hello RJ. Shirley’s profile seems a bit repetitive, especially where you explain she was teaching mathematics and physics to the Returned Servicemen. Did she lecture while she was a student or afterwards?